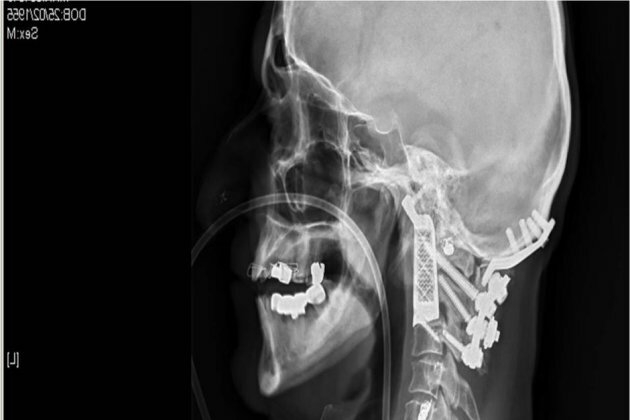 Every year, the number of world-first surgeries with 3D printed materials is on the rise. And a doctor in Australia recently added another success story to the list after implanting a 3D-printed vertebrae into a man’s spine. Last year, neurosurgeon Ralph Mobbs of the Prince of Wales Hospital in Sydney, met a patient suffering from chordoma, a difficult form of cancer. The prospects weren’t looking good for the man. If left untreated, the tumor would eventually compress the spinal cord and brain stem, resulting in quadriplegia. Very few surgeons had ever tried to remove this kind of tumor before, because its location made the surgery high risk. It is possible to reconstruct the vertebrae, but they have to use bone from another part of the body to do it. Getting the right fit is difficult, which is why Mobbs decided 3D-printing was the best option. Mobbs teamed up with Anatomics, an Australian medical device company, to construct the titanium implant. Anatomics also provided Mobbs with several models of the patient’s exact anatomy, which he used to practice the surgery on before attempting it. Even with the ability to practice, Mobbs admitted to ABC news that the surgery was still very high-risk. But it was the only option for the patient that could result in a continued high quality of living. The surgery is the first of its kind with this particular vertebrae. "To be able to get the printed implant that you know will fit perfectly because you've already done the operation on a model ... It was just a pure delight," he said. "It was as if someone had switched on a light and said 'crikey, if this isn't the future, well then I don't know what is’." After a successful 15-hour surgery, the patient is now in recovery. Hobbs said he is doing well, but is suffering some effects of having such an invasive surgery performed through the mouth. "It has caused him some problems with his capacity to swallow, which he is gradually recovering," he said. Mobbs is confident that the use of 3D printing in medicine will continue to grow. "There's no doubt this is the next big wave of medicine," he said. "For me, the holy grail of medicine is the manufacturing of bones, joints and organs on-demand to restore function and save lives."